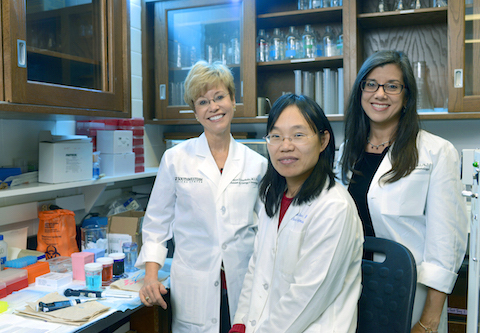 UT Southwestern Medical Center researchers in the Departments of Internal Medicine and Pediatrics collaborated with nine other top research institutions on the study, which was published recently in the Journal of Allergy and Clinical Immunology. Researchers found that injection of the drug omalizumab every two to four weeks during a specific period in the fall reduced the risk of an asthma exacerbation – a sudden, intense worsening of symptoms that requires corticosteroid intervention or hospitalization – by more than 80 percent. The therapy began four to six weeks before the school year started and ended 90 days afterward. Youth ages 6 to 17 were enrolled in the trial, which took place from 2012 to 2014. Recent findings from UT Southwestern pediatric researchers Drs. Rebecca Gruchalla, Baomei Shao, and Michelle Gill (l-r) have unveiled new treatment options for children suffering from chronic asthma. Omalizumab is already approved for treatment of moderate to severe allergic asthma in patients ages 12 and up. Asthma is most commonly treated with rescue or corticosteroid inhalers, or with other asthma medication. Asthma is a leading cause of childhood hospitalizations and missed school days in the United States, according to the Centers for Disease Control and Prevention. Increased exposure to indoor allergens such as cockroaches, dust mites, mold, and animal dander contributes to disease severity, which is disproportionately high among children and adolescents living in inner-city communities. In addition to the clinical trial, study co-author Dr. Michelle Gill, Associate Professor of Pediatrics, Immunology, and Internal Medicine, partnered with colleagues at National Jewish Health in Denver, Colorado to analyze immune cell responses in blood samples from a subset of trial participants. The beneficial effects of omalizumab may be explained by an increased release of the naturally occurring antiviral substance interferon-alpha from the patients’ immune cells, they found. Among the trial participants who received omalizumab rather than a placebo, those with the greatest increases in interferon-alpha experienced the lowest rates of asthma exacerbation. The national clinical trial called PROSE enrolled 727 children and adolescents at eight urban research sites. It was completed as part of the Inner-City Asthma Consortium (ICAC), an asthma research program supported by the National Institute of Allergy and Infectious Diseases (NIAID), part of the National Institutes of Health (NIH). Dr. Gruchalla, who holds the William A. Sellars, M.D., and Joyce M. Sellars Distinguished Chair in Allergy and Immunology, has led the Dallas-based ICAC program for 15 years. Also contributing to the study from UT Southwestern was Dr. Baomei Shao, a research associate in Internal Medicine. The study was funded by NIAID and NIH. It was also supported by the Center for Translational Medicine at UT Southwestern, which is part of a national consortium of medical research institutions working to accelerate the translation of laboratory discoveries into treatments for patients, to engage communities in clinical research efforts, and to train a new generation of clinical and translational researchers.